A state of complete mental attention. A nondual school of Vedanta which argues for the identity of Brahman and Atman. The position that the truth of religious claims cannot be proven and which maintains the need either for faith or for the suspension of belief. A state of consciousness different from the 'ordinary' states of wakefulness, dreaming and dreamless sleep. Jung's psychological and therapeutic approach. Sanskrit and Pali terms respectively for the Buddhist doctrine that there is no permanent individual soul. The belief that a spirit or divinity resides within every object, controlling its existence and influencing human life and events in the natural world. Unusual experiences and events that appear to defy known scientific laws. The elevation of a human being to the level of God or the gods. Wilber's acronym for his all-quadrant, all level (also all lines, all states, all types) approach to knowledge and practice. Jung's term for collective structuring patterns of experience within the collective unconscious. A soteriological path of self-denial or self-mortification. The separation of the astral body from the physical body and its travelling to other places. Also refers to techniques for inducing such out-of-body experiences. The theoretical or practical denial of the existence of a deity. Sanskrit term generally referring to the immortal, divine Soul or true self. Vedantic doctrine of the identity of the true self (Atman) and the Absolute or God (Brahman). Term used in existentialism for living in a way that is honest to the self and that recognises one's freedom and responsibility. The period from around 800 BCE to 200 BCE which Karl Jaspers argues involved a major cultural and psychological paradigm shift in which there developed a focus on the individual and self-consciousness. Tibetan word for the intermediate state between one life and the next. In Hinduism, an approach that emphasises worship and devotion. A path of Yoga that focuses on devotion and worship as means of achieving spiritual liberation. A therapeutic approach that uses body work (e.g., breathing, movement) to encourage the expression of feelings and to relieve emotional and physical blockages. In Mahayana Buddhism, a being who holds back from final enlightenment in order to help others. In Hinduism, the Absolute Supreme Reality, or God. (1) A South Asian spiritual teacher, Siddhartha Gautama, c. 564-483 BCE who was the founder of Buddhism. (2) The enlightened One. (3) In Mahayana Buddhism, any fully enlightened being. Religion based on the teachings of the Buddha. Denies the existence of a Supreme Being and emphasises the achievement of enlightenment and liberation from suffering. A philosophical perspective that is based on Rene Descartes' dualisms between mind and body, or subject and object. In Wilber's model, the causal level refers to formless experience in which there is just the transcendent witness or the root of attention. In Vedanta and Theosophy the 'sheath' or subtle body that persists in dreamless sleep. The causal body does not experience mental forms but exists in a state of bliss. Wilber's term for a stage between personal and transpersonal development involving the achievement of self-actualization, existential authenticity, groundedness, and mind-body integration. Sanskrit word for wheel. Chakras are believed to be centres of energy within the subtle body that are associated with different levels of consciousness. A process in which knowledge (often of a spiritual nature) is communicated from some other being or entity. A movement in Christianity that emphasises personal experience of the Holy Spirit, which is often expressed through healing, prophecy or speaking in tongues. In Chinese philosophy, a vital force that is believed to be present in all things. Religion based on the life and teachings of Jesus, who is understood to be the Son of God. Jung's term for a non-personal, shared level of the unconscious which contains various universal archetypes. An area within religious studies that examines the similarities and differences among different religions. An area of academic research that focuses on understanding the nature of mind and consciousness. (1) Early theological term for mystical experience. (2) Introspective states of absorption. A profound change in religious beliefs. A term coined by Richard Bucke to refer to exalted and joyous experiences of our own deep connection to the whole universe, felt as a living and ordered Presence. Term coined by Arne Naess to refer to the promotion of a deep sense of our connection to and responsibility towards all life on the planet. (1) A supernatural entity worshipped in religion. (2) A God or Goddess. Sanskrit term used in Indian religions to refer to the divine way, divine Will, or spiritual teachings. A condition in which different psychological functions become split off from one another or from consciousness. Obtaining knowledge using signs, omens or oracles. A Tibetan Buddhist lucid dream practice that is believed to prepare the practitioner for the process of dying and the entry into the bardo realms. (1) The Platonic or Cartesian doctrine that mind/spirit and matter/body are fundamentally separate realities. (2) The religious belief in separate and antagonistic forces of good and evil. In Tibetan Buddhism, a meditation practice that focuses on the nondual realization of the emptiness of self and of all phenomena. A movement that emphasises the ways in which both women and nature have been dominated by men and which promotes the values of women, the body, and nature. Focussing on egoic experience and the needs of the ordinary self. (1) Focussing on the needs and experience of the ego. (2) A stage of development between the preegoic and transegoic. Understanding the experience of another from the other's perspective. (1) An eighteenth century philosophical movement that emphasised rationality and humanitarian values. (2) In Indian religions, a sublime state of blissful self-realization and knowledge. A sudden spiritual realization, insight or illumination. An approach to spiritual knowledge based on the study of secret teachings. In Theosophy, a subtle body that houses the vital life-force. Term coined by Rhea White to refer to a broad range of psychic, mystical, peak, and anomalous experiences. A nineteenth and twentieth century philosophical movement that emphasises the implications of human freedom and responsibility and our capacity for self-knowledge. An approach which focuses on women's experience and understanding of spirituality. Term used by Csikszentmihalyi to refer to experiences in which there is total involvement in an activity. A mystical state in which one is aware, but there are no contents of consciousness such as sensations, perceptions, thoughts or feelings. Term used by Maslow and others to refer to transpersonal psychology. A philosophical or (more usually) religious perspective which advocates a rigid adherence to certain fundamental beliefs or principles, and is generally associated with intolerance of alternative views. A term used to refer to Planet Earth as a living being. A religious-philosophical tradition, originating in the period before Christianity, that emphasises salvation through higher knowledge. A central theme in Gnosticism is the evil that is manifest in the material world and the need to escape this through magical or mystical practices. (1) The Divine, Supreme Being. (2) A deity, often male. (1) A female deity. (2) The archetypal female nature deity worshipped in neopaganism. Term used in Christian theology to refer to the ultimate abstract nature of the Divine, existing behind God's personality. The belief in a sequence of evolutionary development from Matter, to Mind, to Soul (and/or Spirit). The belief in the fundamental interconnectedness and inter-dependence of all aspects of creation. A visualization technique in which the person is led on an imaginary journey, usually by verbal instruction. Sanskrit term for a spiritual teacher. Yogic practice that focuses on physical activities for promoting well-being such as posture, hygiene, diet, and breathing. An adherence to occult philosophies and the occult sciences, such as alchemy, astrology and magic. A diverse Indian religion that believes in a Supreme Being (Brahman) who manifests in many forms. Hinduism teaches the doctrines of karma and reincarnation. A sequence of increasing levels of wholeness. A perspective that views phenomena in terms of their properties as wholes. A term coined by Arthur Koestler to refer to wholes which are parts of other wholes. Term coined by Stan Grof meaning 'orientated towards wholeness' that he applies to a range of altered experiences that may, for example, by induced by psychoactive drugs, by Holotropic Breathwork, or other activities. A mind-altering technique developed by Stan and Christina Grof that involves lengthy sessions of altered breathing combined with loud evocative music and body work. A term used from the 1960s to refer to a broad range of humanistic methods and therapies which aim to promote self-realization. An educational and philosophical outlook that emphasises the personal worth of the individual and the central importance of human values as opposed to religious belief. The 'third force' in psychology that focuses on developing the capacity of human beings for self-realization and other 'positive' qualities such as love, empathy, creativity, and altruism. The direct communication of spiritual knowledge to the mind. The belief that the Divine is fully present in the natural Universe. Traditional religious beliefs and practices found among descendants of peoples who originally inhabited a territory prior to any colonization or settlement from outside Generally used to refer to native religious traditions that are not represented in the major world religions. Jung's term for the process of psychological integration that leads towards realization of the archetype of the Self. The quality of an experience that cannot be expressed in words. In religious, esoteric and magical traditions, a formal introduction to the mysteries, to the hidden powers, or to a select community of practitioners. (1) The psychological theories of Sri Aurobindo. (2) Ken Wilber's AQAL approach. A long-term programme of disciplined practice developed by George Leonard and Michael Murphy that aims to work on developing positive transformation and integration of body, mind, heart, and soul. A system of Yoga practice that aims to integrate spiritual awareness into ordinary life. A term used by the Vietnamese Buddhist monk Thich Nhat Hanh to refer to the interdependence of all phenomena and all life . A monotheistic religion based on the writings of the prophet Muhammad which teaches the doctrine of submission to God (Allah). An Indian religion that emphasises asceticism and the perfectibility of the human soul. Jainism teaches the doctrine of reincarnation and denies the existence of a Supreme Being. A Yoga practice that focuses on the gaining of spiritual knowledge and liberation through the intensive study of scriptures and the deep contemplation of spiritual ideas. The religion of the Jewish people, based principally on the Torah and the Talmud. The doctrine that a person's actions produce direct personal consequences for good or bad. Often linked to a belief in reincarnation. In Yoga and Tantra, a vital energy that can be aroused and channelled up through the chakras, leading eventually to spiritual enlightenment or liberation. An experience of arousal of the kundalini energy, often occurring very powerfully. In Indian philosophies, achieving spiritual salvation by freeing the self from the suffering and illusion of the world. Psychotherapeutic approach developed by Viktor Frankl that emphasises the achievement of meaning in life. A term used by Aanstoos and Roll to refer to our experience of a larger soul that extends beyond individual identity to include our deep connection to significant others, the land and posssessions. A dream in which one is aware that one is dreaming. In such dreams the person is fully conscious and often capable of controlling dream events. Activities in which there is an attempt to conjure and utilize unseen forces. As used by Wilber, primitive or prepersonal superstitious thinking in which there is a failure to differentiate fully the self from the natural and social worlds. Sanskrit for 'Great Seal'. A method within Tibetan Buddhism involving the direct, nondual experience of the true nature of Mind. Sanskrit for 'Greater Vehicle'. One of the three major schools of Buddhism which is found mainly in Northern India, China, Tibet and Japan. Mahayana Buddhism emphasises the universal quest for enlightenment which may be achieved in many ways, including the path of faith. Tantric sexual congress involving the experience of Union. A Polynesian and Melanesian word referring to the essential force or power that resides in objects, plants, animals, and people. In Jung's psychology, the archetypal personification of the extraordinary inner power found deep within the unconscious. In Hinduism and Buddhism, a geometric design representing the Cosmos, often used as a focus for meditation. In Hinduism and Buddhism, a sacred sound, syllable, word, or phrase, used as a focus for meditation. In Hinduism, the illusoriness of the phenomenal world. Various techniques of attentional training which aim to be helpful in the spiritual quest. In spiritism, the attempt to communicate with deceased persons or discarnate beings using an intermediary individual. In Theosophy, a subtle body that is the substrate of thoughts, ideas, intellect and reason. In Wilber's scheme, a stage of development that involves the development of egoic consciousness, the self-concept and personae. Maslow's term for a higher form of motivation that aims to actualize the universal values of being. Maslow's term for pathological manifestations of the spiritual impulse. Existing in a realm that transcends physical or psychological realities. A branch of philosophy that considers the reality of invisible forces that may exist beyond the physical and psychological realms. A Buddhist practice of loving-kindness. Meditation techniques that involve observing the activity of the mind. The religious conception of a single and transcendent God or ultimate spiritual principle. Term used by Rupert Sheldrake to refer to a structuring field that exists around and influences all holons. A person who practices or teaches mysticism or has mystical experiences. The individual's direct experience of a relationship to a fundamental Reality. An approach that seeks direct and immediate knowledge of a spiritual reality. (1) A mistaken belief, or half-truth. (2) A narrative story that gives meaning to human life. (1) Thinking using the concepts and images of myths. (2) Archetypal thinking. (1) The study of myths. (2) A system of myths. Mystical experiences that occur in relation to the natural world. A profound pattern of experience that may occur when a person has nearly died or has clinically died and then been resuscitated. Typical features of the NDE include a sense of peace, out-of-body experience, moving through a dark tunnel, the encounter with a loving light, meeting deceased relatives or friends, or spiritual beings, and a life review. An unpleasant, frightening or hellish near-death experience. Term used for a variety of new religious movements that are based on the revival of pre-Christian religion. Neopagan religions often emphasise nature, magic, and the worship of the Goddess and/or Horned God. A philosophical school developed by Plotinus and others from the 3rd century CE which postulates the existence of a single spiritual source of all things (the One) with which the individual soul may be united in mystical experience. An umbrella term for a loose collection of alternative philosophies, religions and practices that emphasize spiritual development and a holistic perspective. Religious groupings that have developed outside the mainstream traditions or that offer radically different interpretations of traditional religious belief and practice. Term used by Jung to refer to the disturbing but ultimately transformational process in which the person is forced to confront the depths of the unconscious. Term used in Hinduism and Buddhism for an ultimately blissful state of spiritual emancipation or liberation from ignorance and attachment. Referring to states of deep knowledge and insight. A state of consciousness or being in which there is no awareness of the distinction between subject and object, or self and other. A condition in which everything is experienced arising as the self. In Kant's philosophy, the unknowable thing in itself, as distinct from the object of experience. Term coined by Rudolf Otto to refer to a direct ineffable experience of the holy or sacred, stripped of its ethical and rational aspects. The belief in, study of, and/or manipulation of hidden forces. Term used by Freud for the experience of blissful, unbounded and timeless oneness with the world. Term used by Wilber for nondual experience. (1) A branch of philosophy concerned with examining what is real, or what can be said to exist. (2) Beliefs about what is real. Communication from a supernatural source in response to an inquiry. An experience in which the location of consciousness and self appears to be outside of the physical body. The belief that the world is a part of God, but that the wholeness of God also transcends the world. The belief that everything is divine, that God is not separate from but totally identified with the world, and that God does not possess personality or transcendence. Phenomena that appear to contradict scientific understanding. A research discipline that investigates scientifically evidence of the paranormal, espectially in controlled laboratory conditions. Term used by Maslow for moments of highest happiness and fulfilment. The belief that all religions share a common doctrinal and experiential core. Lit. 'around birth'. Grof's term for patterns of experience associated with various processes occurring in pregnancy and childbirth. Jung's term for the archetypal mask or set of performances that forms our manifest personality. Term used by Assagioli to refer to the achievement of a well-integrated personality, centred on the personal ego. In Jung's psychology, the realm of the unconscious that contains elements deriving from personal experience, such as repressed memories and emotional complexes. The 1st-person study of conscious experience. In Kant's philosophy, the fully knowable object of experience. Term used by Maslow for experiences of serenity and peace as opposed to high-energy peak experiences. The idealistic philosophy of Plato. The belief in and worship of many gods. A research approach promoted by Martin Seligman that focuses on the empirical study and support of positive emotions, traits and institutions. An approach advocated in much new age literature that emphasises focussing the mind on positive outcomes and the making of positive affirmations. A condition in which the person appears to be controlled or taken over by another force, being or spirit. Cultures and philosophical or religious traditions that developed after the axial period. An approach that emphasises the ways in which knowledge is constructed by the human mind and which rejects the notion of absolute truth. In Samkhya philosophy, the world of physical and mental substance. Cultures and religious traditions that existed before the axial period. A level of development before the emergence of mental-egoic consciousness. A level of development before the emergence of mental-egoic consciousness and the individual personality. Wilber's suggestion that many approaches to spirituality fail to distinguish correctly between prepersonal and transpersonal structures because both share the property of being non-personal. A modern theological movement which adopts a panentheistic perspective and argues that God is involved in the cosmic process and in evolution. Term used in psychodynamic theory to refer to the whole of a person's psychological nature and experience, including both conscious and unconscious layers. Lit. 'revealing the psyche'. A term coined by the British psychiatrist Humphrey Osmond to refer to mind-altering drugs such as mescaline and LSD. Also used to refer to the experiences induced by these drugs. A psychological and psychotherapeutic approach originating in Freudianism, that emphasises the role of unconscious processes. An area of academic psychology which examines religious experiences, beliefs and behaviours and develops psychological explanations for these. Lit. 'mind loosening' psychotherapy which utilizes psychedelic drugs to facilitate the process. Severe mental disorder involving a breakdown in the integration of the personality and loss of contact with reality. Psychological and psychotherapeutic approach developed by Roberto Assagioli which emphasises the need to explore and integrate all areas and levels of the psyche. In Samkhya philosophy, the conscious being, soul, or spiritual self. Wilber's suggestion that a truly integral approach must recognize that all phenomena should be examined from a perspective that considers both (1) insides and outsides, and (2) the singular and the plural. Also see AQAL. A form of mystical practice involving passivity, stillness and quiet contemplation. A system of practice based on the Yoga Sutras of Patanjali which emphasises control of the body and mind, the practice of meditation and the realization of samadhi. Term used in Buddhism to refer to some kind of personal continuation from one life to the next. Since Buddhism does not accept the notion of a permanent self, this is not literally a reincarnation of the same fixed entity. The belief in transmigration, or the progress of the individual soul from life to life. This progress is often seen as serving the purpose of spiritual evolution. A collective system of spiritual beliefs and practices. An academic discipline that studies religions. Term used in Dzogchen for the absolute nondual nature of mind. (1) In Christianity, the condition of being saved or delivered by Jesus or God. (2) Used more generally to refer to the achievement of spiritual perfection or liberation. Meditative absorption or Yogic trance. A Buddhist form of meditation involving concentration and tranquility. School of Hindu philosophy that forms the basis of Yoga. It argues for the reality of two basic principles: purusha and prakriti. The purpose of spiritual practice is to realize our true nature as purusha. A dogmatic perspective that proposes that only the material world is real and that all phenomena can be fully explained using the principles and methods of a materialist science. Term used in humanistic psychology to refer to the full realization of a person's potential. Term used in different ways to refer to the realization of a better state of being. (1) For Maslow, the transcendence of personal identity in peak experiences or through metamotivation. (2) For Frankl, the actualization of meanings and purposes that go beyond the self. Jung's term for the archetype of darker, sinister, hidden tendencies within the psyche that contrast with the consciously expressed ego or persona. A healing practice in which the person undertakes a journey in imagination during which help is sought from spirit helpers or spirit guides who often appear in the form of animals. An indigenous spiritual tradition in which the shaman (seer or sorcerer) undergoes, in trance, a journey to the spirit world to bring back knowledge or power to heal the community. Paranormal powers associated with the practice of Yoga. The study or doctrine of salvation. The uttering of words or sounds that appear to represent an unknown language. Also known as glossolalia. Wilber's structural-hierarchical model of development. Wilber's model for the development of consciousness through levels of the spectrum. A structural-hierarchical approach to understanding the development of value systems within organizations and societies developed by Beck and Cowan. An approach, illustrated in the theories of Jung, Grof and Washburn, which argues that transpersonal development involves recontacting the dynamic potentials within the unconscious. A term used in a variety of different senses including: (1) an animating principle, (2) a supernatural being, (3) consciousness, (4) the soul, (5) the transcendent witness, (6) the essence of the Divine. The belief that psychological disturbances can reflect the attachment of a spirit entity to a person. In certain beliefs, a spirit entity or archetypal being that communicates information and guidance. A therapeutic method that aims to release the person from spirit attachment. The belief in a realm of discarnate spirit entities (e.g., deceased persons) with whom communication is possible. 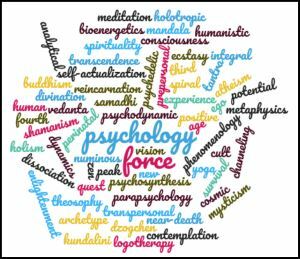 Term used by Stan and Christina Grof for disturbing and often overwhelming crises that may be indistinguishable from psychosis, but which represent a process of transformation and spiritual opportunity. The loving blissful union of the soul with God. Term used by Chogyam Trungpa for a form of self-deception in which spirituality becomes a subtle means to fulfil egocentric desires. Term used by Jorge Ferrer for a focus on the achievement of spiritual benefits for the self such as sublime inner experiences. A spiritist movement that originated in America in the 1840s and became fashionable on both sides of the Atlantic in the late 19th and early 20th centuries. A belief in spirit or a commitment to a spiritual perspective on life. Often used in a non-religious sense. Theories such as Wilber's spectrum model and Spiral Dynamics that propose a hierarchical sequence of structural stages of development. In Theosophy and other esoteric traditions, non-physical bodies that human beings are believed to possess. A mystical philosophy within Islam that emphasises love and the constant remembrance of God. Buddhist term for the experience of the void, or emptiness. The belief that some aspect of the human being (generally the personality or soul) survives bodily death. Jung's term for external events that occur in meaningful coincidence with processes in the psyche. Acting in harmony and collaboration, to the benefit of all parties. A Chinese system of exercise involving smooth movements that aims to produce a healthy flow of chi and a state of physical and mental relaxation. The collection of early Rabbinic writings which form the basis of orthodox Judaism. An ancient tradition, which is found in both Hinduism and Buddhism, that focuses on awareness and use of the energies of the body, relationships and the cosmos for spiritual purposes. Tantra uses ritual and magic and is often associated in the West with sexual spiritual practice. In Taoism, the eternal source of everything and all change. A Chinese philosophical and religious system which emphasises living in effortless harmony with the Tao. The study of the Divine or religion. A philosophical system that derives from the writings of Helena P. Blavatsky who founded the Theosophical Society in 1875. Theosophical teachings are based on an esoteric interpretation of Hinduism and Buddhism and on the belief in the perennial philosophy at the core of all religions. Pali for 'Elder Doctrine'. One of the three major schools of Buddhism, Theravada adheres closely to the original teachings of the Buddha. It proposes that enlightenment is achieved through one's own spiritual effort and, especially, through the monastic life. Found chiefly in Southeast Asia and Sri Lanka. The use of magic to achieve spiritual salvation. Maslow's term for humanistic psychology. A Tibetan meditation practice in which the meditator visualizes taking negative and harmful influences into the self and sending out positive and beneficial influences. In Judaism, the teachings given by God to Moses. An altered state of consciousness in which the person is relatively unaware of the surroundings. Going beyond or above the normal situation. Term used by Jung to refer to the natural tendency of the psyche to creatively resolvbe oppositions and to unify unconscious and conscious contents. The pure subject of experience. Often used to refer to a metaphysical reality beyond the physical and psychological realms. A level of development after the emergence of mental-egoic consciousness. A profound change from our usual egoic, self-centred existence to some ultimately more satisfying or valuable condition. (1) Beyond the individual or personal. (2) A level of development after the personal. An approach that emphasises the importance of expanding our concern and sense of self outwards to achieve a wider and deeper identification with the natural world or Gaia. (1) Sometimes used in the general sense of transpersonal studies. (2) Scientific investigation of the psychological aspects of transpersonal events. Assagioli's term for the synthesis of the personal ego and the higher self or transpersonal self. Also known as spiritual psychosynthesis. Umbrella term for a general range of approaches and disciplines for investigating the transpersonal. Term sometimes used for the opposite of a peak experience, involving profound unhappiness, despair or suffering. (1) Not conscious. (2) In psychodynamic theory, the realm of the psyche that is not available to consciousness. A mystical experience of oneness or union. The perspective that there is one truth in all religions. Sanskrit for 'Diamond Vehicle'. One of the three major schools of Buddhism, Vajrayana is a Tantric form of Mahayana Buddhism found in Tibet and Japan. Hindu philosophical school that emphasises the divinity of the soul (Atman) and the achievement of salvation through service, meditation and self-knowledge. A Buddhist form of mindfulness meditation which aims at gaining insight into the nature of mind. Vipassana entails witnessing the physical sensations and mental activity as these arise in consciousness. In some Native American cultures, the ritual seeking of guidance from the spirit world through visions induced by isolation or fasting. Often undertaken by males as a rite of initiation at puberty. Wilber's term for a higher mode of systemic thinking that is capable of holding and integrating different perspectives that may formerly have been considered contradictory or incompatible. Wilber argues that vision-logic arises at the Centaur stage of development. Techniques of meditation or prayer involving the mental imagination of sensory (especially visual) experience. The experience of ultimate emptiness. A modern neopagan religion which uses witchcraft for benign purposes. The use of magic, especially as traditionally practiced in rural communities. An ancient Indian tradition that aims to lead the practitioner towards spiritual consciousness and liberation. The Zen practice of mindfulness meditation, traditionally performed while sitting. A school of Mahayana Buddhism, found mainly in China, Japan, Korea and Vietnam, which emphasises the path of meditation and self-realization.